Related to my previous writing about MVC, there is other thing that I'd like to share. Previously, I wrote that MVC helped a lot in creating a big (enterprise?) application. While MVC defines layers that represent layer in same level, DAL (Data Access Layer) provides a depth in application abstraction. 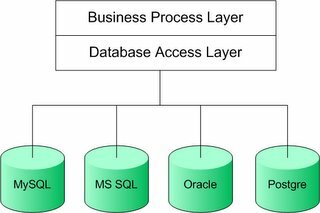 DAL logically inserted below business process layer to provide independent-to-database access. The DAL itself contains implementation to specific database access and also interfaces to business process layer. The benefit of DAL is not far difference with MVC. 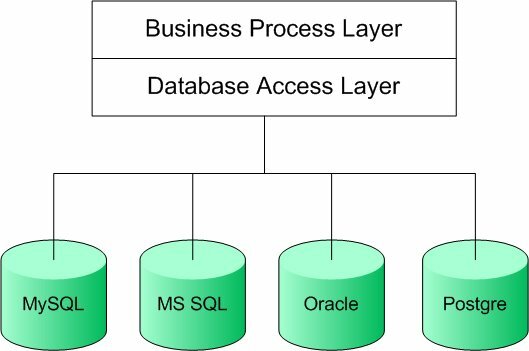 By separating business process with data access, we may create several implementation of data access (to MySQL, MSSQL, Oracle, etc) without having problems changing the business process. I'm curious to see how you can put the UI layer (consists of your MVC stuffs) along with the business logic and data abstraction layer. And how about drawing an arrow that show the dependencies between layers (for instance, some of business logic layer objects should know about some DAL objects, or vice versa). for a more loose-coupling design, it's common to add another "thin" layer between BPL and DAL, which known as "Transfer Objects", and which usually persistable. These transfer objects represent any data entity you have, and they are independent to whatever the underlying data storage mechanism you use. can be aware of it. Therefore that's why this article is amazing.